The two moons may look like they’re almost touching but in reality they were nearly half a million miles apart! Because of Cassini’s long-duration, multi-season stay in orbit around Saturn, researchers have been able to learn more about the ringed planet and its fascinating family of moons than ever before possible. Cassini is now going into its tenth year at Saturn and with much more research planned, we can only imagine what discoveries (and images!) are yet to come in the new year(s) ahead. Read more about the images above and see even more on the CICLOPS Imaging Team website, and see the NASA press release here. Thanks to Carolyn Porco, Cassini Imaging Team Leader, for the heads-up on these gifs — er, gifts! The feature is pretty in a picture, but NASA has a special interest because there is nothing else like this anywhere in our solar system, the agency stated. The immense storm stretches 20,000 miles (30,000 kilometers) across with winds whipping in its jet stream at 200 miles per hour (322 kilometers per hour). And despite all the turbulence, the storm is staying put at the north pole for reasons scientists are still trying to understand. Cassini has been orbiting Saturn since 2004, but it’s only since last year that it’s been able to peer at the hexagon with much success. That’s because the angle of the sun is finally favorable to peer at the storm. This has allowed scientists, for example, to look at the types of particles inside. They discovered that the jet stream is a sort of barrier around the storm, delineating a location with a lot of small haze particles and few large haze particles. (It’s the opposite outside of the jet stream). Scientists said it looks like the Antarctic ozone hole on Earth. “The Antarctic ozone hole forms within a region enclosed by a jet stream with similarities to the hexagon,” NASA stated. Should Cassini have enough funding to function for a few more years, scientists are eager to watch as Saturn gets to its summer solstice in 2017 and the lighting gets even better around the north pole. 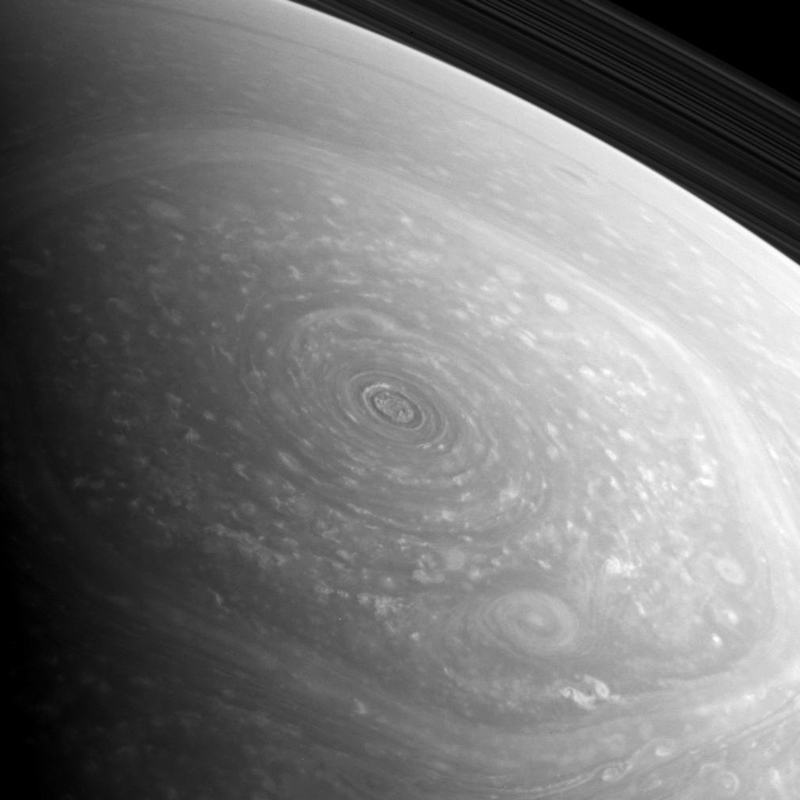 Freshly delivered from Cassini’s wide-angle camera, this raw image gives us another look at Saturn’s north pole and the curious hexagon-shaped jet stream that encircles it, as well as the spiraling vortex of clouds at its center. Back in November we got our first good look at Saturn’s north pole in years, now that Cassini’s orbit is once again taking it high over the ringplane. With spring progressing on Saturn’s northern hemisphere the upper latitudes are getting more and more sunlight — which stirs up storm activity in its atmosphere. The bright tops of upper-level storm clouds speckle Saturn’s skies, and a large circular cyclone can be seen near the north pole, within the darker region contained by the hexagonal jet stream. This could be a long-lived storm, as it also seems to be in the images captured on November 27. About 25,000 km (15,500 miles) across, Saturn’s hexagon is wide enough to fit nearly four Earths inside! Watch a video of the hexagon in motion here. The rings can be seen in the background fading into the shadow cast by the planet itself. A slight bit of ringshine brightens Saturn’s nighttime limb. Cassini was approximately 579,653 kilometers (360,180 miles) from Saturn when the raw image above (W00079643) was taken. Ok, are you ready for this? This swirling maelstrom of clouds is what was seen over Saturn’s north pole earlier today, November 27, by NASA’s Cassini spacecraft. This is a raw image, acquired in polarized light, from a distance of 238,045 miles (383,097 kilometers)… all I did was remove some of the hot pixels that are commonly found on Cassini images taken with longer exposures. Pretty darn cool… Cassini does it yet again! 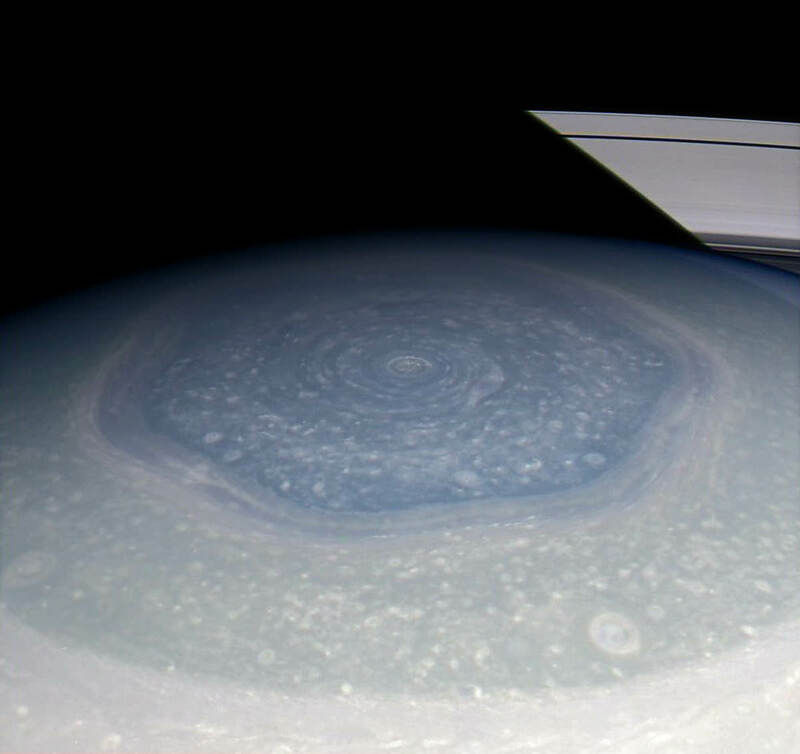 Captured with a wider angle, in this image the hexagon structure can be made out as well as the cyclone, which sits at the center just over the pole. Saturn’s hexagon is about 25,000 km (15,500 miles) in diameter… large enough to fit almost four Earths inside. This image was also acquired today. It’s been a few years since we’ve gotten such a good look at Saturn’s north pole… thanks to Cassini’s new orbital trajectory, which is taking it high above the ring plane and poles of Saturn, we now have the opportunity to view the gas giant’s dynamic upper latitudes again. I’m sure this is just a taste of what’s to come!